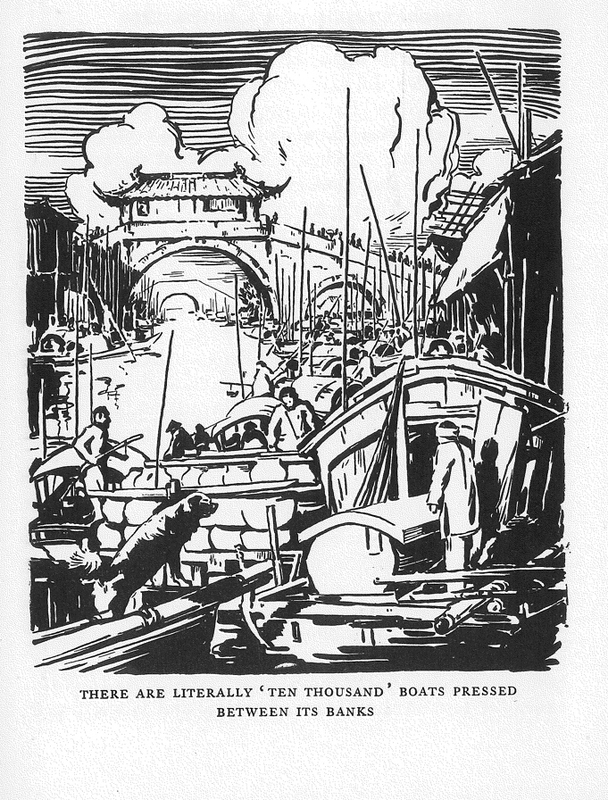 Arthur Smith, Chinese Characteristics (New York: Fleming H. Revell Company, 1894) p. 136. The picture that Smith references is reproduced below. A pity that neither Browne nor Smith, writing decades later, found it worthwhile to unpack the motley composition of a very interesting looking group of dogs. 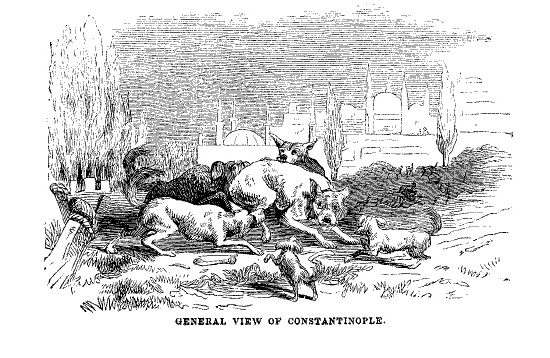 Rather, their own prejudices compelled them to Orientalize, homogenize, trivialize, and ultimately to dismiss a scene which no doubt could have revealed a radically different conception of how dogs have long been an organic element of their own environments, with fortunes and vicissitudes determined by human interference — whether native or colonial. 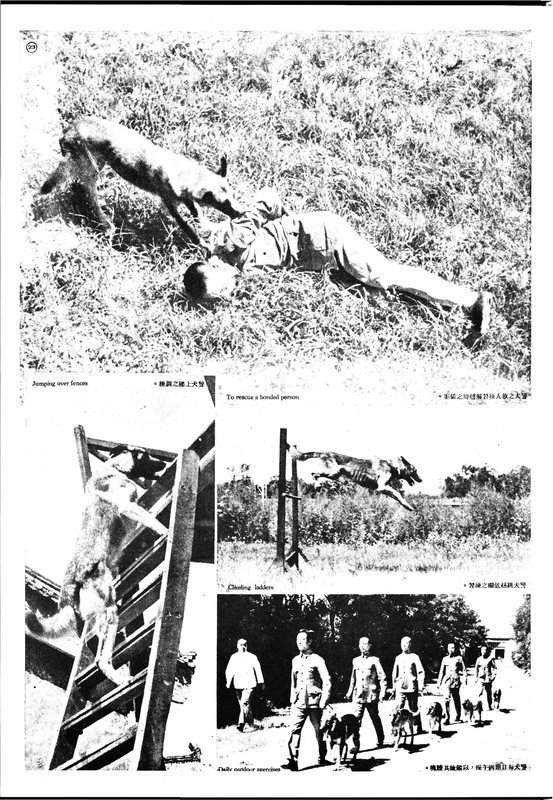 When I read these anecdotal encounters between imperialist men and foreign dogs, the language is often so thick with ideological bias, I can’t help but to regard it all as fiction. By fiction I don’t mean writing which is false, but rather, an imaginative account that situates and embeds an author in a particular time and space, even as they purport to be offering transcendent, ahistorical facts. As a matter of habit, I am suspicious of anyone who relies on the authority of facts to speak unaided. For behind every such act of “objective” documentation, there has always been a person — the objectifier who selects and crafts their textual, visual, phonographic or other evidence, transforming it from the merely true to the real. 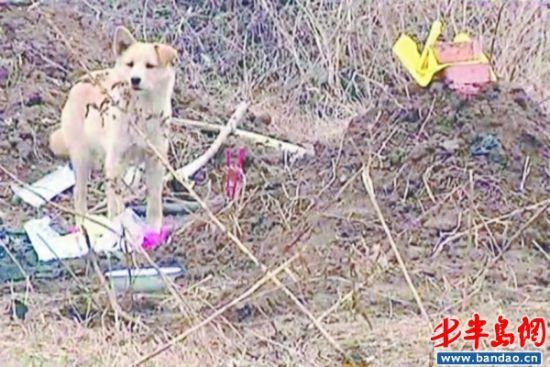 A while back on our Facebook page (which you should ‘like’ for occasional updates that don’t usually overlap with blog content), I reposted a link to a BBC story about a loyal dog in China who would not leave his dead master’s grave. Cynically, I commented that the only reason the BBC considered this “news” was because it came out of China. That is, it’s no surprise to anyone who knows dogs that they express something we might describe as loyalty. 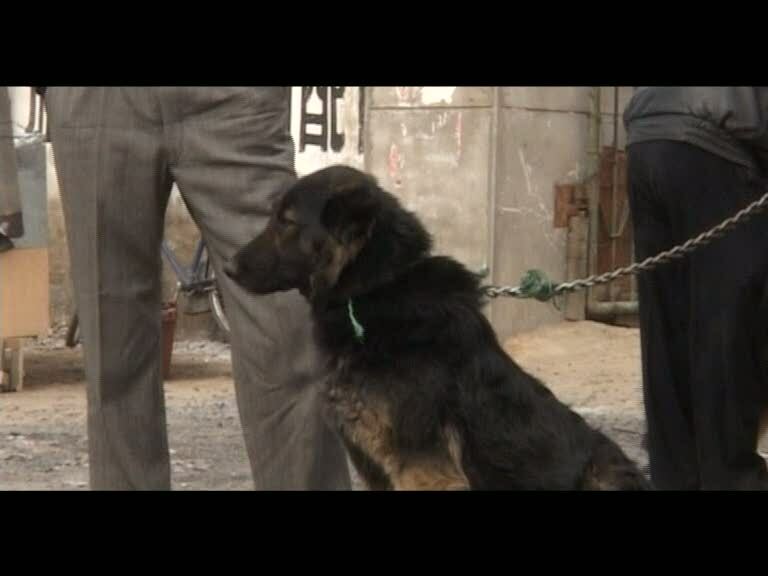 For the BBC, with its typical anti-China’r reportage (sometimes warranted, sometimes mere ideological reflex), this account was rather anomalous for the sheer fact that the Chinese villagers are represented as being sympathetic to the dog’s plight. The BBC story concludes noting that the villagers were moved to continue feeding the dog, and had planned to erect a shelter for him. I wanted to square this against a report from Chinese photojournalist Wang Meng (王猛), who posted a slightly different story a few days after the BBC for Bandao News. According to Wang, the original owner, a 68-year-old single man, had passed from illness on November 11th. 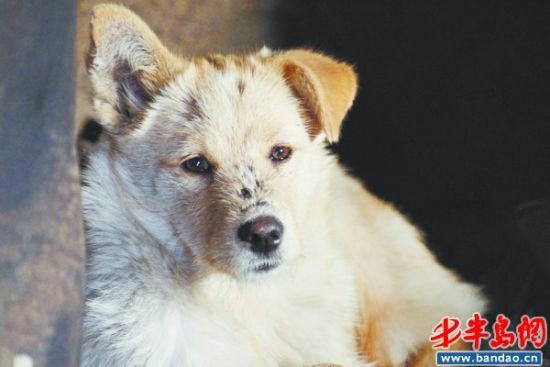 As it turns out, he had left behind two dogs — Dahuang (大黃 or “Big Yellow”) and Xiaohuang (小黃 “Little Yellow”). Xiaohuang was discovered on the 16th, having starved to death in the absence of the old man. 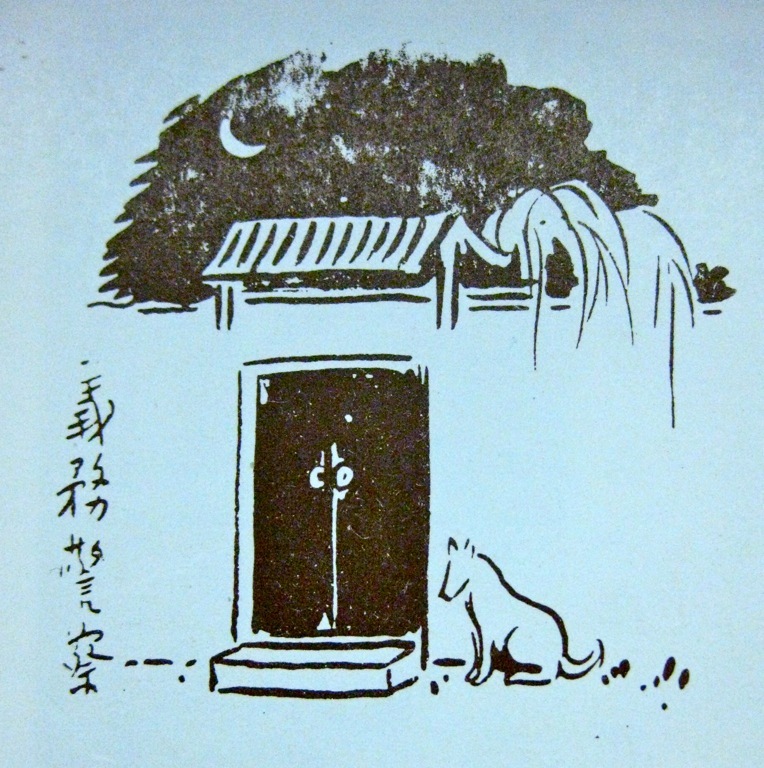 Dahuang, the dog originally featured in the English report, had disappeared for a while, but reappeared after the old man’s burial to linger at his grave and keep guard over the now-empty house. Wang noted that around November 19th, Dahuang had ducked back home with a lame leg and a bloodied muzzle, and showed no further inclination of wanting to venture out of the house. At the time of the writing, he was refusing food, even offerings of sausage ham from the reporter. Villagers feared that he had resolved to commit suicide by starvation, as they had ruled the cause of Xiaohuang’s death. Given this chronology, I’m not sure when the “seven days” fast referenced in the BBC story took place. I’m also less impressed by how the dog’s plight was enfolded into a romantic story of everlasting loyalty beyond the grave to a dead master. Here’s the thing about most stories about loyal dogs. Someone always has to die for such loyalty to find its fullest expression. Part of this is sad reality. Life ends, and life goes on; there is nothing new under the sun. But the way that death is framed, and where the narration is truncated, often reveals less about valor itself, but how we measure such stoicism. When we talk about loyal dogs, we look for emotional servitude that exceeds a lifetime to affirm that our mortality matters at all. The figure of the dog that pines after a dead master is readily absorbed into a human-centric conception of the world at the expense of the animal’s autonomy. A similar hierarchical ordering of nature propels stories of noble animals that “sacrifice” their own lives to preserve another human’s. What I’m saying is that there is room for us to be moved less by death, but by the every day living relationship between humans and animals. I wish I had known more about Old Pan, the man who lived unwed and childless in that decrepit hovel with two constant canine companions for four or five years. Certainly he knew every day how special his dogs were, and his ghost — if there are such things — must find it horribly ironic that their lives only became significant because of the circumstances resulting from his death. 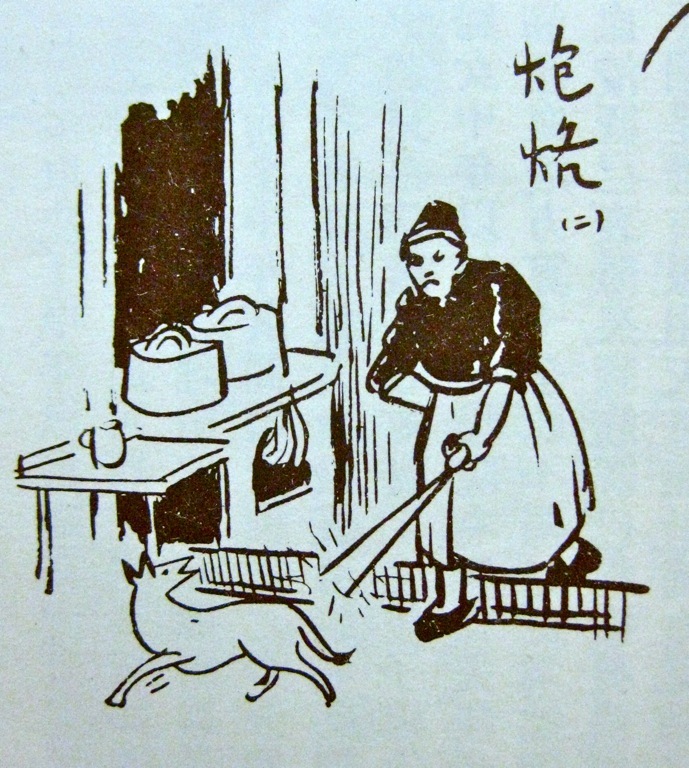 Anyway, the last that I read of Dahuang the loyal dog was a follow-up posted on December 1st. When word got out about his plight, one reader was moved not by the fairytale future fabricated by the BBC report, but by the report of his injuries and his lack of immediate shelter. On November 28th, a woman, surnamed Yue 岳, drove out to find him with an entourage of eight other people. 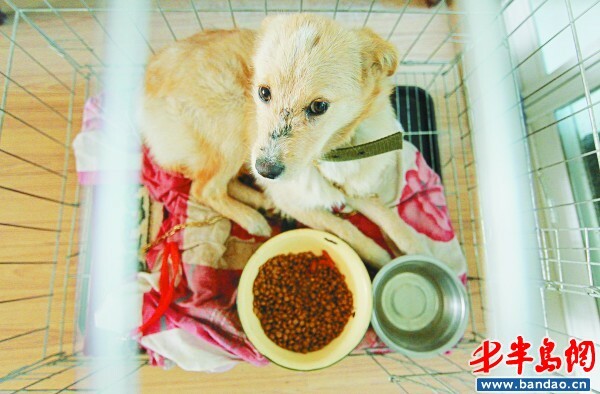 They captured Dahuang by luring him onto a soft kennel mat, wrapped him up, and then drove him back to their home. Over the course of several days, Miss Yue had been trying to win him over with food, treats, and conversation. There’s something extremely rich about this last detail to me: According to the article, she stayed up the first night talking to Dahuang until 3 AM. She explained that Old Pan was dead, she was his new caretaker, and she didn’t want him to starve himself. And as if he understood, he got up and swallowed the chicken eggs she offered. Who’s going to tell her that her words didn’t matter? As far as she’s concerned, they both passed some test of inter-species communication by giving him a reason to keep on living — never mind all who would claim reason as the privileged domain of humans. Once Dahuang regains his strength and he’s acclimated to the new environment, Miss Yue intends to get him vaccinated. She is dog-experienced, and calls herself a dog lover. Even the local veterinarian has vouched for her in the article, assuring the reporter that Dahuang will have a permanent, stable home. She intends to rename him Chengcheng 诚诚, honesty and sincerity, to honor his virtues. So obviously, these stories of loyal dogs are not without inspirational value. But I think it’s worth stepping back and asking why these stories endure so persistently, with such modularity, across so many cultures. I certainly don’t have a universal answer. It’s something I’ll have to think about some more. 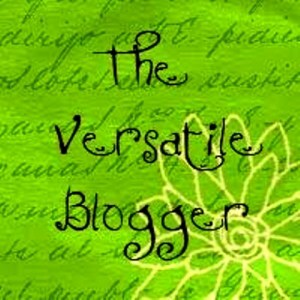 Indeed, there’s no shortage of opportunities to revisit the theme. To conclude, I’m reaching far back in the past to append an excerpt from Gan Bao’s Sou shen ji [搜神紀], a set of “anomalous” historical accounts compiled in the 4th century CE. This early anecdote suggests a premodern lineage to this idea of a dog’s faithful nature that long preceded contemporary media accounts. The following is translated by Kenneth DeWoskin and J.I. Crump, Jr., from their collection In Search of the Supernatural: the Written Record (Stanford: Stanford University Press, 1996) p. 241. I’ve changed their Romanization to pinyin where applicable, for ease of reading. Li Xinchun came from Ji’nan in Xiang-yang in the days of Sun Chuan. His family owned a dog named Black Dragon, which Xinchun loved deeply. 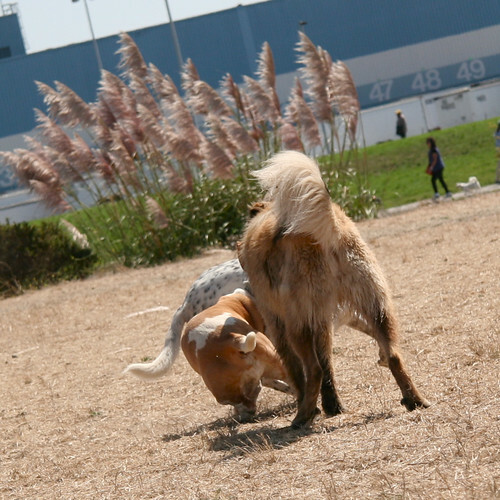 Walking or seated, they were always together, and the man shared everything he ate or drank with that dog. One day Xinchun had been drinking at a tavern outside the city walls and had become so drunk he could not make it home. 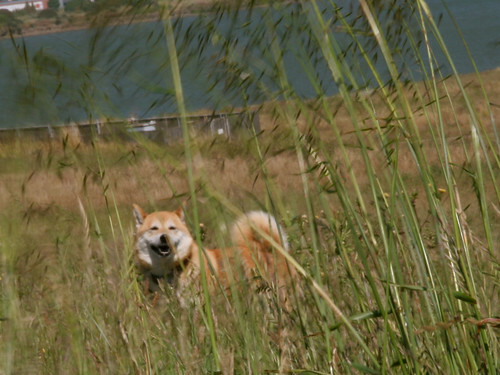 He lay down and slept in a field of dense grass. Now, it happened that the Grand Protector was on a hunt in the area, and seeing how dense the grass was in the field, he dispatched a man to set it afire and burn the cover off. Xinchun’s grass bed was downwind of the flames. Black Dragon saw the fire coming and seized his master’s clothes, but Xinchun did not move. Near where his master slept ran a small stream — perhaps thirty or forty paces away. 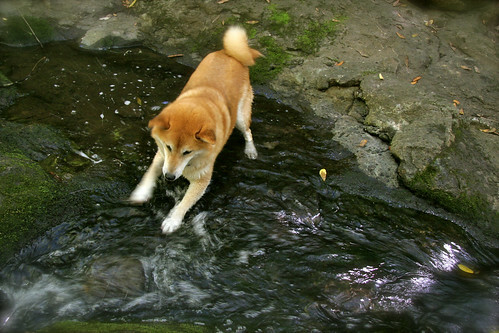 The dog raced over to it and jumped in the water to wet his coat. He returned and rolled all about near Xinchun’s bed, thoroughly wetting down the grass. 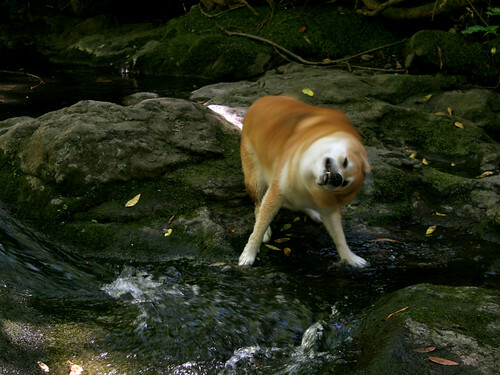 The dog so exhausted [himself] spreading the water everywhere that he finally dropped dead beside [his] master. 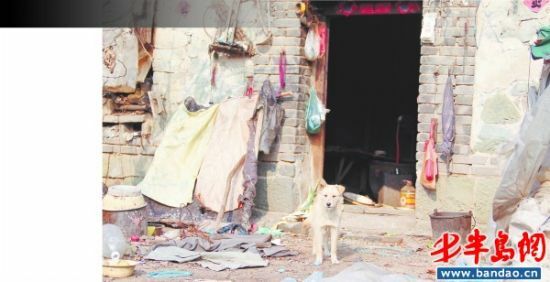 Suddenly Xinchun awoke and saw the dog dead beside him with [his] coat soaked. He was astonished, but seeing the wet grass all about him, he understood in a flash what had happened and burst into tears. 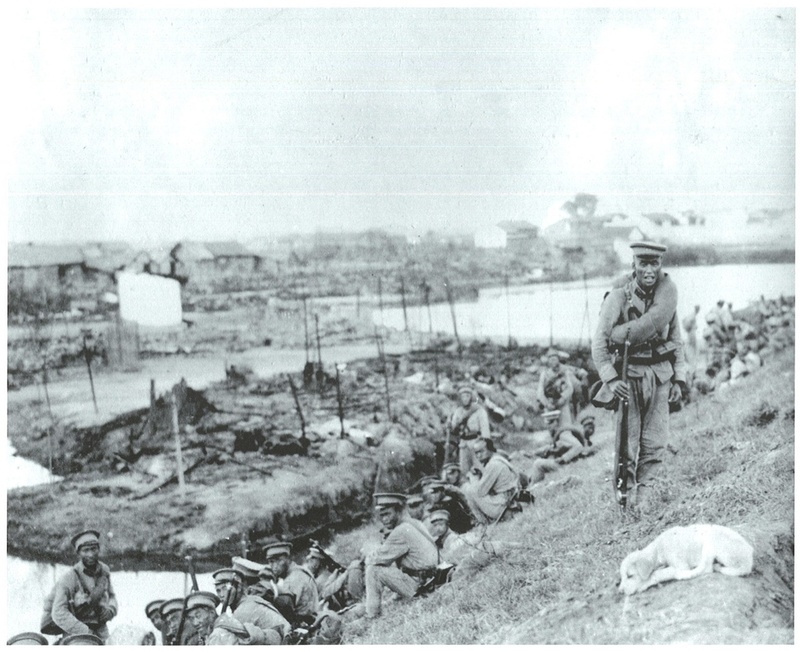 These events found their way to the ear of the commandery’s Grand Protector who felt sympathy and compassion for the dog. “A dog’s willingness to show gratitude far surpasses man’s,” said he. “Men are no match for the dog when it comes to faithfulness.” He then ordered that the dog be buried properly shrouded and in a wooden coffin enclosed within a brick vault. To this day there stands in Ji’nan the Tumulus of the Faithful Dog, and it is many rods in height. 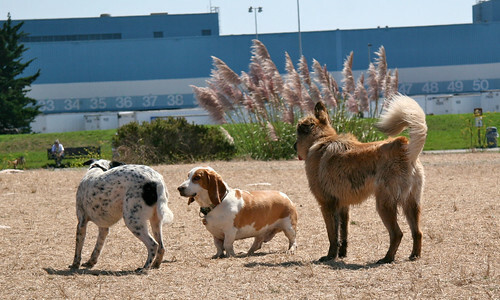 I am intrigued that this is a more active representation of canine loyalty, perhaps ridiculously so. But even though the dog is granted a bit more agency in this tale, the final burden of recognition is on the human who commemorates the dog’s sacrifice. 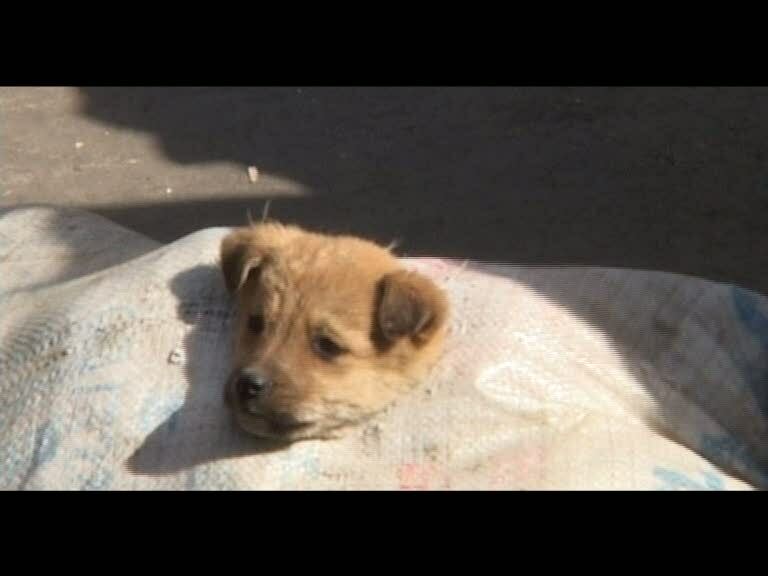 In a rural Chinese town, a bunch of puppies are stuffed tightly into two hemp bags, sealed inside, then left in the road. Men and chained dogs mill about, nonchalant and idle. 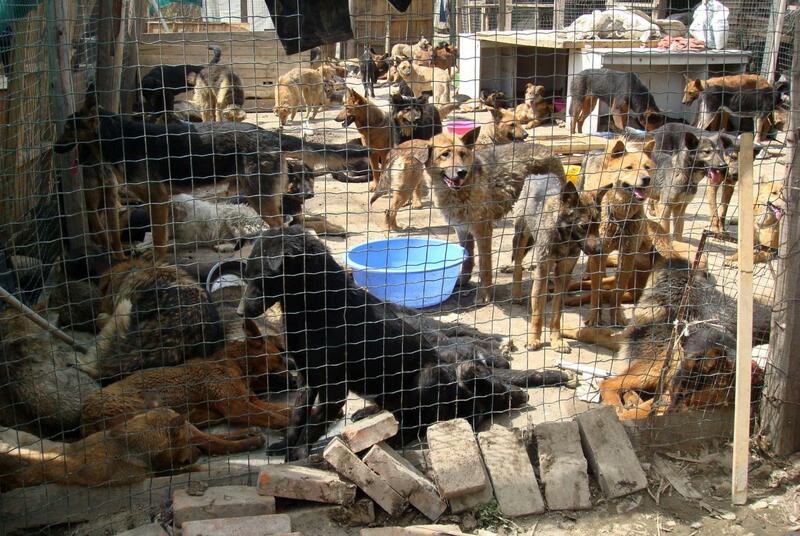 The puppies continue crying in the background, indignant, scared, cramped and confused. You cannot see them, but you cannot ignore them. Eventually, one of the puppies manages to chew his way out of imprisonment. First his muzzle is visible, then his whole head. Rebirth. His attempted escape is noticed, and the surrounding villagers react with bemusement. A few hands tug at the bag, twist it around for a better view, but the puppy doesn’t try to worm his way out. Instead, he sits silently, almost too docile for the situation, while the remaining puppies continue to squirm inside the bag. And with no further explanation, the film ends. It’s all of six minutes long. When I am in a good mood, I am willing to interpret the film as a message of hope. Maybe this is the lone brave wolf who might be saved from the rest of the puppies’ unknown fate. There’s at least one resourceful, resilient puppy in the whole bag. This one has proven himself to be ahead of the pack. But when I’m in a foul mood, I can’t see what the poor puppy could possibly look forward to — a lifetime chained to a tire in a dusty yard, like the rest of the adult dogs? Did he stop trying to fight his way out when he saw how little his escape mattered? Where would he or could he have gone if he was able to get out? It’s the dilemma of Lu Xun’s iron house for the new millennium, written doggy-style. True, in spite of my own conviction, I could not blot out hope, for hope belongs to the future. The outcry of the past century rendered as the whimper of puppies in this contemporary version. How one reacts to these pitiful cries — as dog, as human, as film spectator — is really the central test. Availability: A supplementary short to the DVD Jia Zhangke Collected Short Films [Jia Zhangke duan pian ji 贾樟柯短片集] (Guangzhou: WorldStar Music, 2007) or streaming on various sites online. All three lists above are from Gallant, p. 11. There should be quotation marks around it, or at least the entire thing should be set off in blockquotes, but I was having formatting difficulties. 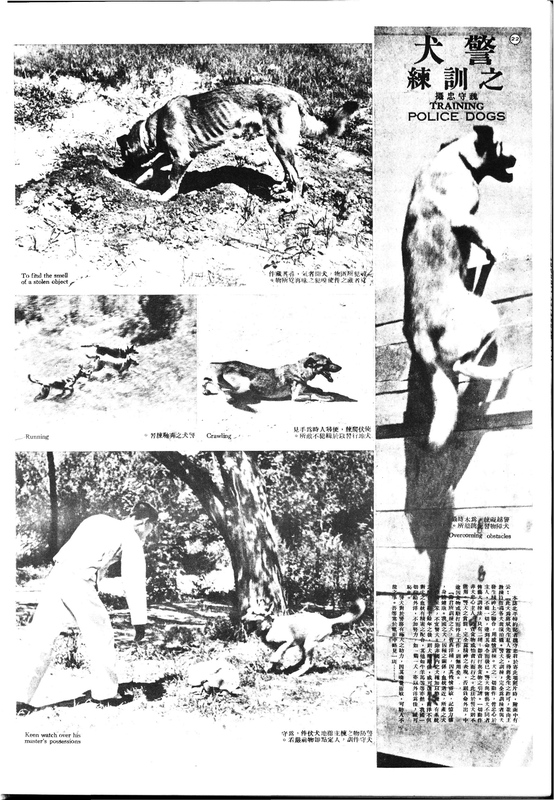 The above is adapted from material provided in QIN Yongzhou 秦永洲 and LI Yunquan 李云泉, Zodiac Dogs [Sheng xiao gou 生肖狗] (Jinan: Qilu, 2005) p. 16. Hello weekend. We seeee you. 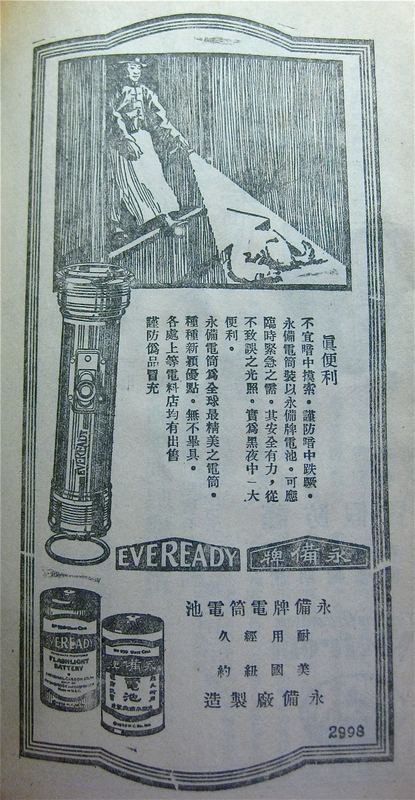 The American Eveready company (known today for Energizer batteries) published a series of ads illustrating the urban dangers that could be illuminated and thus avoided if one is prepared with a battery-powered electric torch. Not only could a simple flashlight help catch burglars, surveil sneaky, promiscuous daughters, and thwart child kidnappings, they could also help prevent hapless citizens from getting mauled after tripping over a sleeping street dog. From The Autobiography of a Chinese Dog, written by Yo Fei and edited by his missus, Florence Ayscough (Boston: Houghton Mifflin Company, 1926). Yo Fei was a Chinese ha pa dog 哈巴狗, the Chinese predecessor to the pug. He is named after the 12th century general Yue Fei 岳飛 (in modern spelling) — a very large personality to embody in such a little dog! Scissors which lay hold of the waters in the Pine-Tree River of Wu, and cut them in half. I fancy that it is greatly changed now-a-days. Cottonmills, silk-mills, factories of all sorts line its sides; and there are literally ‘ten thousand’ boats pressed between its banks. These boats are loaded with every imaginable cargo from bales of cotton-seed to piles of pottery jars — jars of peacock blue and soft pellucid green glistening in the sunshine. They are the homes, too, of many thousand people, who are born, live, and die between their decks. So, as we ferried across the Wu Sung River, we saw Chinese life at every stage; here an infant tethered to the gunwale, there a coffin awaiting burial. The illustrations by Ayscough’s frequent collaborator and fellow expatriate Lucille Douglass really add to the charm of this most curious artifact. While this quote was selected merely for my own amusement, and has nothing directly to do with Chinese dogs, other parts of the book offer more vivid depictions of life as a lapdog in Republican Era China. There’s also a fairly extensive summary and review of V.W.F. 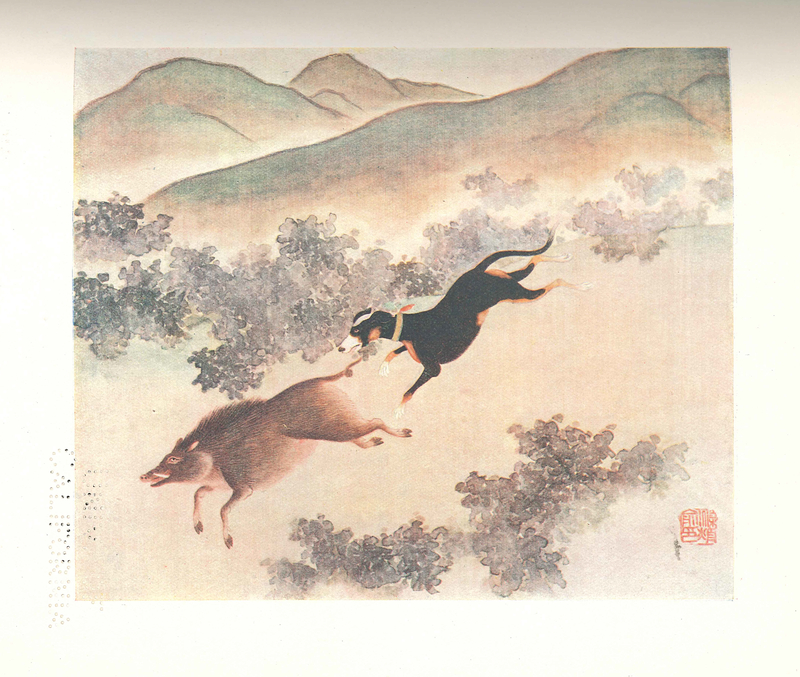 Collier’s Dogs of China and Japan in Art. This is supposed to be my “fun” bedtime reading, but the grad student’s curse is to close read everything as if it were potential dissertation fodder. One thing I can say in favor of this book so far — if I ever find myself in a spiteful and foul mood after grading a stack of poorly-written student papers, I’ll be able to ream out my class by telling them that I’ve read dogs with more substantial thoughts on topics in Chinese culture, literature, and arts. Someone has been slowly recalling my library books on Asian dogs. Don’t get me wrong — I’m guilty of hoarding (as are most academics I know), and I certainly don’t begrudge this stranger their right to use the recall function. Yet, the longer a book stays in my “care,” the more attached I get. The sting of having to relinquish my stash would be lessened if I could find out who is also checking out these books, as I’m sure we could have some interesting conversations. Obviously, the library can’t just give out this kind of patron information.